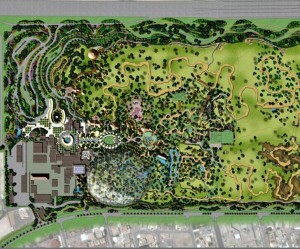 Final Concept and Master Plan Design of the New Doha Zoo Revealed! Doha – 13 November 2013: The Public Works Authority “ASHGHAL” launched the final concept master plan for the New Doha Zoo’s development project, and appointed KEO International Consultants as the project’s Design and Construction Supervision Consultant in cooperation with HHCP+PJA with a QR 230 million contract. As one of its development projects, Ashghal has started working on the New Doha Zoo according to a specific schedule. In July 2012, Ashghal has announced a design competition to come up with the primary architectural concept and general master plan for the project; and many International Consultants have participated with innovative ideas. After going through its careful procedures the steering committee chose the appropriate concept, and in December 2012 Ashghal has appointed the international consultant HHCP+PJA to develop a concept master plan for the New Doha Zoo; and on its behalf, HHCP+PJA has delivered its task. It delivered the designs, plans, and maps. It also appointed best in class international specialists, each in his or her field, and studied the best international practices in zoology. At the end, HHCP+PJA was able to deliver the New Doha Zoo concept master plan, whose implementation is expected to commence in 2014 to be inaugurated end of 2017. New Doha Zoo, when completed, will be one of the biggest and most beautiful zoos in the region, a model for park’s sustainability on the regional and international levels. The Partner and Managing Director of HHCP, Mr. Gregory Dungan said that based on the Higher Authorities vision, his company developed the zoo “to provide visitors a one-of-a-kind experience that sets a new global standard for zoological parks. This new vision establishes the zoo as a must-see destination for visitors from around the globe, which will be visited over and over again”. In addition, the zoo will contribute towards the enrichment of knowledge and awareness of environmental issues and preservation of our ecosystem. The zoo will also have an international leading role so far as awareness about wildlife and biodiversity are concerned. It will also show the extent of the interconnectivity between the different regions of the world and the Qatari rich bio-diversified environment. In order to enhance the positive environmental impact of the zoo, more than 12, 500 trees will be planted, some are local and others are brought from different geographical areas, in addition to the current 1, 000 trees in the zoo. The area of the Doha Zoo is 75 hectares, which is seven times the size of the current zoo, and will be divided into several regions that will represent the natural and climatic features of three continents. There will be an “Africa Safari, ” which is characterized by forests, savannas; an “Asia Woodland, ” which is characterized by charm natural features and mountains; and a “South America rainforest, ” which is characterized by dense and rainy forests, and there will be rainy parts in this region to enrich the visitors’ experience who will feel that they are truly walking in one of the dense tropical forests of South America. The Zoo will be interweaved with a public park with no fences that obstruct the vision; and therefore, will not affect the landscape of the surrounding streets, but will add an aesthetical dimension and green spaces to them. Each region of the Doha Zoo can be discovered through multiple safari trips that will take the visitors on memorable journeys across the zoo and its vast green landscapes to watch the wildlife species of each of the three continents. The safari trips will vary between car trips, trekking on foot through safe passages, trips by boats and Children’s Safari that commensurate with their age and maintain their safety. The features of the zoo include as well the educational role through establishing a training center for animal care, and allow researchers and practitioners to have a first-hand experience in this field, and originate training and educational programs to introduce students and teachers alike to the wildlife and different fauna and flora of each of the three continents of the zoo. The zoo hosts a two‐story Discovery Center that includes small animal exhibits, gallery spaces for interpretive exhibits, and spaces to offer a variety of education programs. The Discovery Center’s small animal enclosures and dazzling visual media exhibits will interpret Qatar’s wildlife and cultural heritage, national wildlife research and conservation initiatives, and Doha Zoo’s involvement in conservation programs and partnerships. The Zoo will be delivering unforgettable entertainment experience through 3D and 4D interactive theaters, in addition to a “live” digital host animal that interact with the audience, then takes visitors on several animal‐centered adventures to explore the amazing world of nature. All animals of the current zoo will be moved to equipped shelters in Rawdat Al Faras farm, where they will be surrounded by specialized experts who offer them advanced medical care, until the completion of the Doha Zoo’s development project. The new Doha Zoo will not just be another zoo stretching over a wide area of land, but it will also be a touristic, entertaining, and educating site by all measures. Many restaurants and indoor and outdoor cafes will be built; perhaps the most prominent of these restaurants will be the “African Restaurant” that will be inspired by the magic of wild African life. There will also be the “Tropical Rain Forest Restaurant, ” and a special restaurant that will be surrounded by giraffes from every direction, and will allow its guests to have a direct encounter with the giraffes from the restaurant’s top level. There will also be the capability to build three hotels each is inspired by the continent area that hosts it, so there will be a tree house hotel in the African section, another will be inspired by the mountainous style at the Asian section, and a cabana style at the South American part. The Doha Zoo development project is one of the important projects entrusted to ASHGHAL. It falls within the competence of the Buildings Sector as part of the Buildings Program that includes construction of major projects during the next five years in various fields.